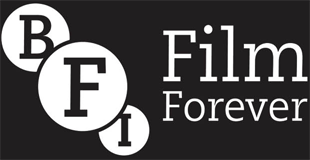 Summary: A technical film showing the process of manufacturing bricks in Woodside in Croydon. 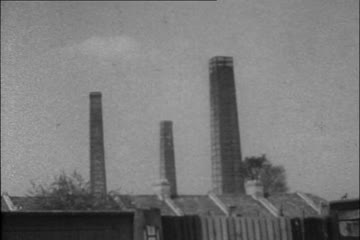 Description: The film begins with shots of several towering chimneys, followed by external views of the vast brickworks, which stood in the remains of a wood. Next come shots of the coal-fired boilers. Workers, not wearing any protective clothing beyond caps, are then seen loading bricks onto metal pallets. Confusingly, the next shots show the clay on a conveyor-belt about to be cut to brick size, which should have preceded this stage. The brick-cutting sequence is then repeated in error. Workers transport the pallets by forklift truck to the arch-shaped kilns. A man is seen smearing clay against the bricks to retain heat during firing. Next a worker removes a plug to inspect the inside of a furnace, which is white hot. The film ends with the fired bricks being removed and stacked. Further information: There have been brickworks in Croydon since the late 18th century. At the height of the industry in the late 19th, there were as many as nine, of which the largest was Handley's Brickworks off Hermitage Lane. These works covered a site the size of 23 football pitches and were originally owned by Horris Parks. When the foreman was caught milking the books, Mr Parks committed suicide by hanging himself in the drying shed. His business was then bought in 1915 by Edward Handley, a brickmaker from Lincolnshire, whose family firm also owned the Acton & Willesden Brick Company in London. With the mechanized excavation of clay, which had formerly been dug by hand, the business grew rapidly. Demand for housing was strong after the First World War, and despite the Depression of the early Thirties, 1 million bricks per week were being produced by the latter part of the decade. By this time the company had become one of the largest family-owned brickworks in the country and employed 250 men. A 2ft gauge diesel railway was built during this period to transport clay from the vast claypit to the kilns. Two of the five kilns were built by a German company in 1934. Within a few years, the site was targeted by German bombers with hundreds of incendiary bombs landing in the area. A V1 rocket also struck and considerable damage was caused, though no-one was killed at the works, unlike surrounding residential parts of Croydon. The lack of loss of life was largely down to the fact that the Ministry of War had ordered its closure on the outbreak of war. Their reasoning was that this was a residential area; demand for bricks would be low; fuel would be saved; and workers would serve the war effort better by enlisting. The claypit was used to hold 60 million gallons of water for the London Fire Service during the war, though from 1944 onwards, the site operated as a collecting-point for heavy battle equipment, including Sherman tanks, in readiness for the invasion of France. When production resumed after the war, Edward Handley renamed the firm Woodside Brickworks, after the local district of Croydon it stood in. Output steadily rose to pre-war levels to meet the great demand for new house-building. The seven chimneys for the coal-fired steam engines, which heated the kilns to 1000 degrees centigrade, were over 100ft, the tallest 160ft, and a landmark on the skyline for over half a century, including being visible from the London to Brighton mainline just a couple of miles away. Clay deposits had begun to run out in the Sixties, when Handley sold the business. Manufacturing finally ceased in 1976, ending nearly 200 years of brick-making in the town. Because all sorts of rubbish had been dumped, for a charge, on the site over many years, expensive decontamination was necessary before Croydon Council, who bought the site, was able to build several streets of houses on it, all named after medal-winning British athletes. What a great find, and very interesting. My father and grandfather both worked at Woodside Brick Works in the 50's. Granddad's name was John (Jack) Pester, and my dad's was Ron Pester. My dad worked in the brickworks from 1949 until he was killed in an accident there in 1964. We lived in Meadvale Rd in a house owned by the brickworks.